The Activio Solution License need to be configured to be able to use myActivio.com (upload heart rate data) and Activio Virtual Trainer (download and use the class profiles). 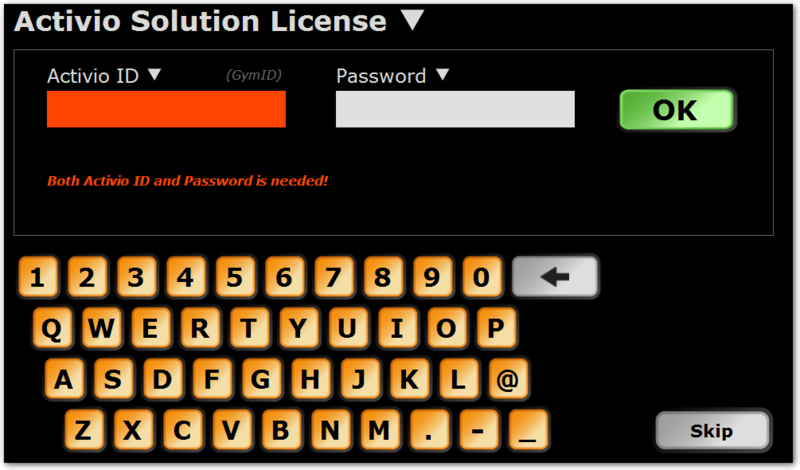 The license use an Activio ID (also known as a GymID) and a password. These credentials are provided by Activio when the license is purchased. They can also be found on the USB stick that followed with the system delivery. This step can be skipped by pressing "Skip" if there is no need to use myActivio or Virtual Trainer. The license can be setup later in the System settings. After this installation step the HR Receiver is initilized and started and the system is ready to go!